Spencer Barros in Deepest Man. Photo by Juliano Chiquetto. BOTTOM LINE: Holograms, projections, and live action tell the story of Dr. Sommers in a compelling production. Deepest Man charts the inner journey of Dr. Sommers (Spencer Barros) as he explores the grief caused by his wife’s death. A voiceover greets the audience as they enter the space, explaining the physical effects and some of the spiritual motivations for the extreme sport of deep free-diving. A minimalist glass sink and table occupy the front playing space, behind it the transparent plastic screen that will later make holographic projections possible, and beyond this another larger playing space. Nurses (Libby Skala & Miguel Reis) and another doctor (Vienna Carroll) enter with Dr. Sommers, gossiping amongst each other. A few lines reveal that Sommers is in this instance a patient, and that this is some sort of mental ward. An alarm sounds calling away the nurses and the attending doctor. The voiceover returns, this time more pleading than informative. Sommers approaches the sink, and at the insistence of this voice, places his face in the water. Projections on the side of the stage show the space flooding with the water; we are joining Sommers on his aquatic spiritual journey. Sommers exits as Des’ree Collins (Alva Chinn) enters. In talk show host style she addresses the audience and speaks about grief, extreme sports, and the new age concepts of Cymatics, the healing power of water, and ‘channel surfing.’ We realize that Collins is the voice that has been and will continue to guide Dr. Sommers. Sommers is now on the other side of the large plastic screen. An unpleasant noise seems to attack him as a ghostly female figure, his deceased wife, flashes for an instant beside him. We also see a projection of him face down in the sink, as before. 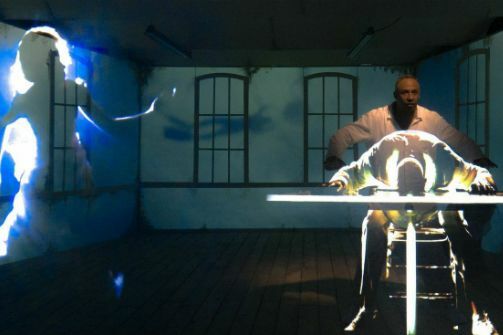 He imitates this projections pose, blurring the line between the projected and the live imagery. We wonder, is he still face down in the sink? The ghostly image reappears taking this story to a much darker place. The story continues to go deeper as Sommers has several more surreal encounters with Collins. After a particularly intense encounter, shadowy figures pace around the space and warn him that Collins is a false messiah that will only destroy him. Three other characters are introduced and share their stories of loss due to extreme storms. Taking on the mantle, and the wig, of Collins, Sommers attempts to use new age ideas on water, love, and vibrations to console these characters. However, he goes too far with his emulation of Collins and only succeeds in alienating the other characters. As the piece draws to a close, the projection of the ghostly figure returns as does the one showing the Dr. face down in the sink. In these final moments he delivers a monologue summarizing his grief and his inability to escape it, before his true and terrible fate is revealed. While the story of Dr. Sommers is compelling, the main draw for this performance remains the use of projections. The piece attempts to combine these projections and live action so that their differentiation becomes difficult. This technology facilitated the Tupac hologram at Coachella, among others. However as Gizmodo points out, this is not actually holographic technology. It is in fact high tech augmentation of a 19th Century Technique known as ‘Pepper’s Ghost.’ So while certainly impressive and of impeccable quality, these images are not holographic or even 3D. Hence the necessity of the large transparent plastic screen. In most instances the visuals were striking, terrifying, or crucial to the story. In some instances though I began to question why they were being used; to further this story and empower this performance or to show technical proficiency. The performances are effective, in particular Alva Chinn plays Collins to perfection showing her as the almost too perfect new age saviour for the masses. Vienna Carrol, Miguel Reis, and Libby Skala show great skill playing multiple characters and drawing the audience in. Spencer Barros is proficient and holds his own as the tragic Dr. Sommers. This performance only falters in its dramaturgical underpinnings. The themes, intent, and world of the play seem slightly out of focus. The performance explores the theatrical possibilities made available by projections, yet at the last instant of the piece the back wall pulls away to reveal an elaborate and haunting set depicting a house ravaged by an extreme storm. While thematically connected to the piece as a whole, this sudden introduction of such a dense physical presence in contrast to the ghostly projections of the rest of the piece is jarring. This could be a very effective moment, but in its current form it does not connect to the audience or read properly. Deepest Man has wonderful potential; touching on how we create what is sacred and real with profound insight. What it requires is an adjusting of the theatrical lens to make the intent, the world, and the performance more effective.